canvas and paints: Whats it all about? Its that simple; you tell me what you'd like me to paint, and I paint it. The only exceptions are images that are violent, abusive, exploitative or damaging. I get to call that, you don't. You pay me for the canvas and postage via paypal, then donate to Oxfam via my donations site, which I send to you once I've agreed to paint for you. Once you have done that, I start your painting. I will send you the painting once it's finished. I paint one picture a month, on average. Check out some of the paintings I've been doing over the last few years. They are mainly images from video games that I've painted for people all over the world. In return, they have bought goats, school meals, portable classrooms, health care workers, all sorts of useful things for people in need. 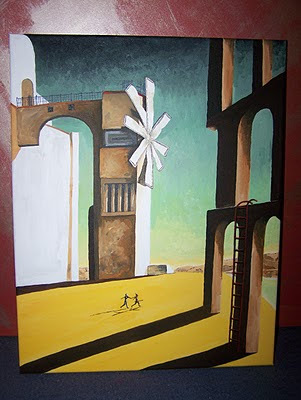 This is the painting that started it all off - my son asked me to do a couple of pictures for his walls, I did an Ico and Kid A, a Radiohead album cover. He then asked me to paint another for his Santee, who, on receiving it, posted an image on line. I've been painting ever since. I love to paint. It relaxes me, provides me a positive, creative outlet, and raises funds for 2 charities I support. Emergency Response: people need help in an emergency – fast. Oxfam saves lives, swiftly delivering aid, support and protection; and we help communities develop the capacity to cope with future crises. Development work: poor people can take control, solve their own problems, and rely on themselves – with the right support. Oxfam funds long-term work to fight poverty in thousands of communities worldwide. My family has been involved in volunteering for Oxfam for many years; painting is just an extension of this volunteering. People who commission my paintings buy stuff from Oxfam Unwrapped instead of paying me, buying what they can afford, and what they think the painting is worth. There are flocks of goats roaming the world, there is a portable classroom, hundreds of school meals have been bought, its just wonderful to see what people do when given the choice. Child's Play is a charity that was set up in 2003 by Mike Krahulik and Jerry Holkins from Penny Arcade and is dedicated to improving the lives of children with toys and games in a network of over 60 hospitals worldwide. In just a few years, the gaming community worldwide has come together to raise millions of dollars to provide consoles and games to children's wards and hospitals worldwide. As a small child, I spent many weeks in Newcastle City General and Carlisle General hospitals, having corrective surgery. Apart from being painful, it was isolating, and very, very boring. Child's Play provides stuff to help with the boredom and isolation. People involved with Child's play do all sorts of things to fundraise, from marathon playing every level in every Super Mario game; last year's 96 hour event raised over $29,000 for Child’s Play. Also, each December in Seattle, there is a fundraising dinner, with an auction of many wonderful things donated by the gaming community. I send 3 paintings, which raise around $2000. If you'd like to contact me to talk about anything related to canvas and paints, you can email me.